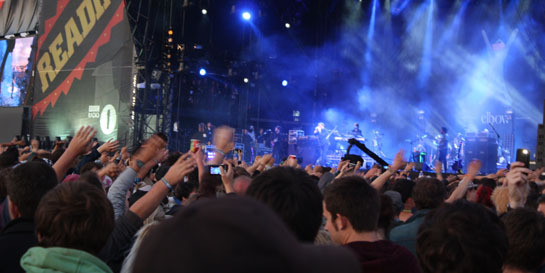 The third and final day of Reading 2011 was by far its busiest. The main road leading up to the festival was jam packed with thousands of festival goers eager to get a prime spot infront of the main stage. Frank Turner has the crowd crouched down in preparation for his grand finale. The balloons became a handy tool for keeping track of your friends as you weaved through the crowds. Rizzle Kicks had some unusual pre-show rituals. This chap was incredibly disappointed that Take That weren't playing at the festival. Death From Above 1979 in the NME/Radio1 tent. Fiction's Elbow played their last festival of the year. Their set included a special birthday song for bassist Pete as the sun went down. Highly anticipated headliners Muse with their unusual stage furniture. Fireworks were a great way to close the weekend.